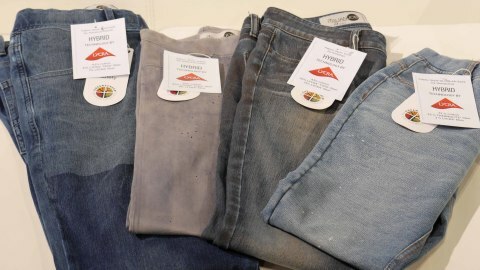 INVISTA, owners of the LYCRA® brand, and Garmon S.p.A., the premiere denim finishing house, will debut a collection of knit denim concept garments at the Kingpins Show in New York City on May 11-12. The collection integrates fabrics made with INVISTA’s LYCRA® HYBRID technology together with Garmon’s latest finishing techniques including chemical formulations assessed using GreenScreen® for Safer Chemicals. Introduced at the last Kingpins Show in October, LYCRA® HYBRID technology enables mills to create denim fabrics that combine the comfort and flexibility of a knit with the authentic aesthetics and performance typically found in woven denim. Through its collaboration with Garmon S.p.A., INVISTA aims to show the variety of aesthetic possibilities that can be achieved with knit denim fabrics using LYCRA® HYBRID technology. Developed by the NGO Clean Production Action, GreenScreen® allows companies to transparently assess, compare and communicate information on chemical toxicity. By employing this process, Garmon was able to select chemical finishes with relatively low environmental impacts. For example, in lieu of using potassium permanganate, Garmon selected Avol Oxy White and the latest enzymatic solutions to maximize eco efficiency. The Kingpins Show is an invitation-only, boutique denim sourcing show featuring a highly-edited selection of vendors that include denim and sportswear fabric mills from the U.S., Japan, China, India, Italy, Turkey, Egypt, Pakistan, Thailand, Spain and Mexico, wash houses, full package manufacturers, trim providers and business solutions. LYCRA®, dualFX® and THERMOLITE® are trademarks of INVISTA.